This is a vintage Philbrick K2-W vacuum tube operational amplifier! Turns out they have quite the following. 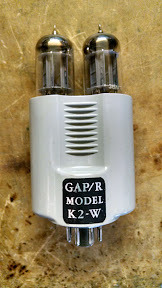 Sadly the original 12AX7 tubes were gone–somewhere, someone probably has rare GAP/R marked tubes in their guitar amplifier. I put in some generic replacements. I decided to build a little jig to try it out. 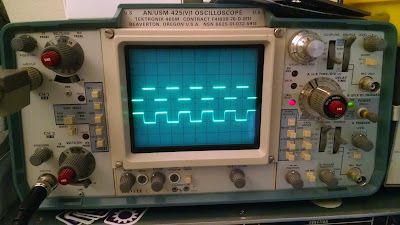 This is based on the inverting amplifier schematic given in the K2-W datasheet I linked above. I added a simple linear power supply to generate the +/-300V rails. If you build your own supply, be sure to add bleeder resistors so you don’t get a nasty surprise after you turn it off and try to work on it. Neat! The top trace is the input and the bottom trace is the output. The bottom trace has a magnitude of 50Vp-p, as expected. It’s really interesting to see how the short paragraph of specifications at the bottom of the first page of the K2-W datasheet developed into the formal electrical characteristics tables you can see in more modern op-amp datasheets, like the 741. Amazing bit of history. Thanks for showing this! 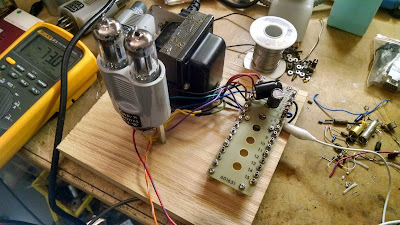 It’s just a Hammond transformer connected to a bridge rectifier made out of 1N4007s and some “big” (>470uF) electrolytic capacitors.